← Peer assessment : is it better to give or to receive? What sorts of e-assessment questions do students do best at? Multiple choice? Short-answer free text? The table below shows the average score per question (out of 3), for all students and all questions of each type, used in S104 over a whole presentation. 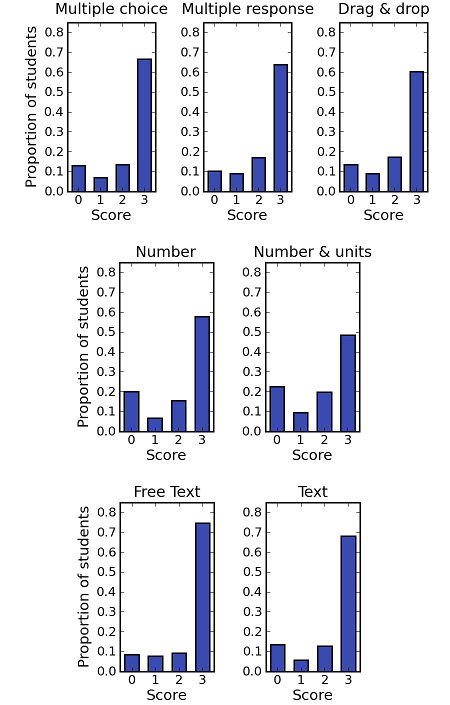 You’ll see that, amazingly, the scores are highest for short-answer free-text questions (the ones where we ask students to give their answer as a phrase or sentence). Perhaps the questions of this type that we are asking are just too easy. Whatever, it’s a surprising result. Mutliple choice questions are not necessarily the easiest; indeed for this presentation of S104 they were definitely not the easiest. It just goes to show that outcomes aren’t always what we expect. This entry was posted in question difficulty and tagged e-assessment, multiple choice, question difficulty, question types, short-answer free text. Bookmark the permalink. 4 Responses to What sorts of e-assessment questions do students do best at? Nice graphs. I think it is interesting to also post more complete data, such as the number of tests taken form the basis of the graphs, item discrimination indices and so. Good point Silvester! I’ve written more about this on my COLMSCT website, but this is currently not available for technical reasons – grrrr. I’ll email an internal paper to you – I hope to publish the results properly at some stage. The analysis included 17 multiple choice questions, 20 drag and drop questions, 29 drag and drop questions, 34 numerical questions, 11 numerical questions with units, 12 text questions and 9 short-answer free text questions. The mean number of students per question was 1195.